You may brush your teeth regularly but if you aren’t doing it right you could be wasting your time, or worse, you could actually be damaging your teeth and gums. The first thing is to buy the right toothbrush. Different toothbrushes achieve different results. A soft bristled brush is best for removing plaque, and a child should certainly only use a very soft brush. Toothbrushes with small, diamond shaped heads are great for getting hard to reach places. If you have problems with removing food particles from between teeth or molars a smaller, medium bristle toothbrush may be right for you. Talk to your dentist about what’s best for your teeth. Gently brush the outside, inside and chewing surface of each tooth using short strokes. Use a gentle circular motion on the inside and outside surfaces to clear plaque and gently massage the gums. A brisker back and forth movement is okay for the grinding surfaces of your back molars. Take your time. We recommend that you spend at least two minutes brushing your teeth. This may seem like a long time when you’re rushing for work in the morning, but it is necessary ensure that your teeth are thoroughly clean. Most people brush for less than a minute — not long enough to get teeth clean and scrub off the bacteria that can lead to gum disease and tooth decay. If you’re not sure how long you’re brushing for, set a timer. Tilt your toothbrush to a 45 degree angle and ensure that you are cleaning both the outer and inner surfaces of your upper and lower teeth. It is equally important to clean the chewing surfaces of your teeth – plaque can accumulate in the depressions of your molars. 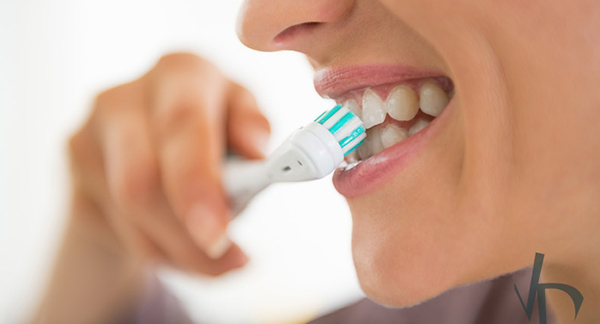 Be gentle, harsher brushing can actually abrade the enamel on your teeth. If you brush twice a day the bacteria and any deposits will brush away quite easily. When brushing your teeth, it’s important to use short, precise strokes. This ensures that you don’t cause any trauma to your mouth and that you reach the specific areas you are trying to target. Don’t forget your tongue. Brushing your tongue is an essential part of maintaining proper oral care. Many people often overlook this step, but it is important to both your overall oral hygiene and the freshness of your breath. The American Dental Association recommends brushing your teeth at least twice a day. When you brush your teeth, you help remove food and plaque — a sticky film that forms on your teeth and contains bacteria. You should also brush after any sticky or sugary snacks as bacteria can quite quickly release acids that attack tooth enamel. Use fluoride toothpaste and floss at least once a day. If you have any concerns about how you’re cleaning your teeth, talk to the clinicians at Normanhurst Dental. They can check your teeth and advise on the best toothbrush and they can easily tell if you’re not brushing effectively.